Received October 27th, 2010; revised November 15th, 2010; accepted November 18th, 2010.
gress, many outstanding problems still remain unsolved. 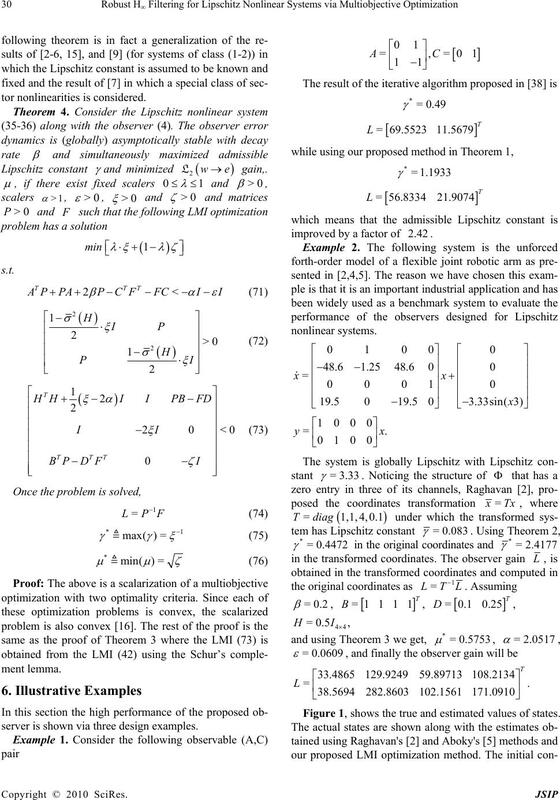 is called the Lipschitz constant. bance, a disturbance attenuation level is guaranteed. rem states the main result of this section. Based on Schwartz inequality, we have Equation (24). rate is a measure of observer speed of convergence. 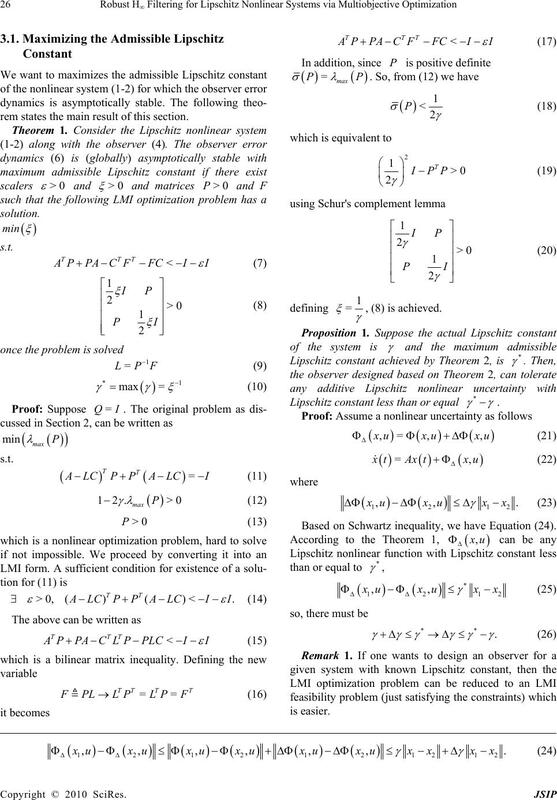 following LMI optimization problem has a solution. norm upper bound is simultaneously guaranteed. an inequality that will be used in the proof of our result. , (18) always implies (49). 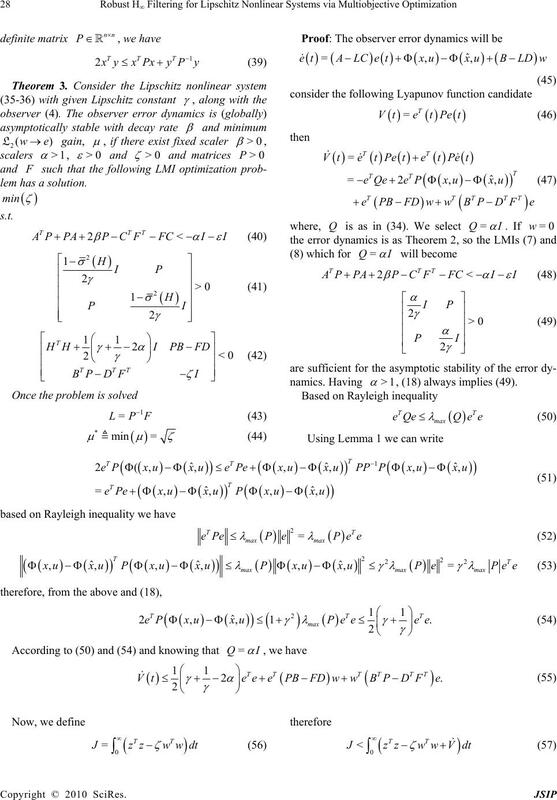 but we have Equation (59). ables, thus resulting in a problem that is not linear in P.
which is equivalent to (41). 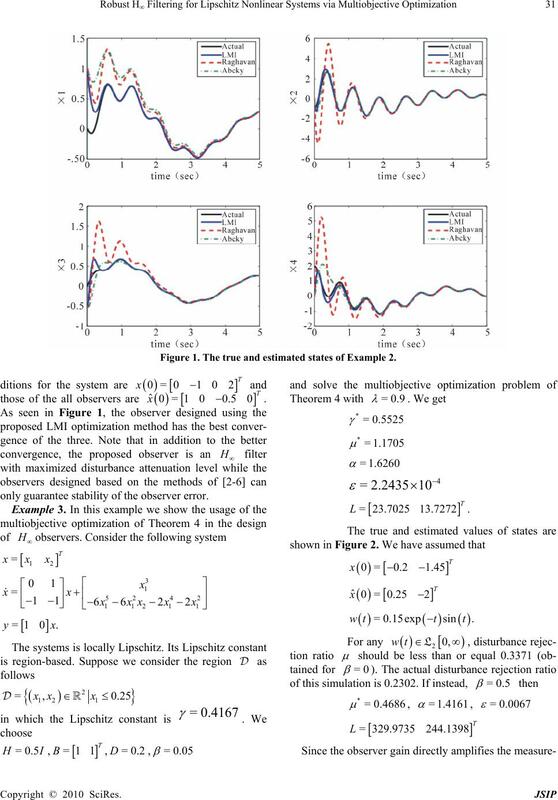 tion problem is reduced to an LMI feasibility problem. 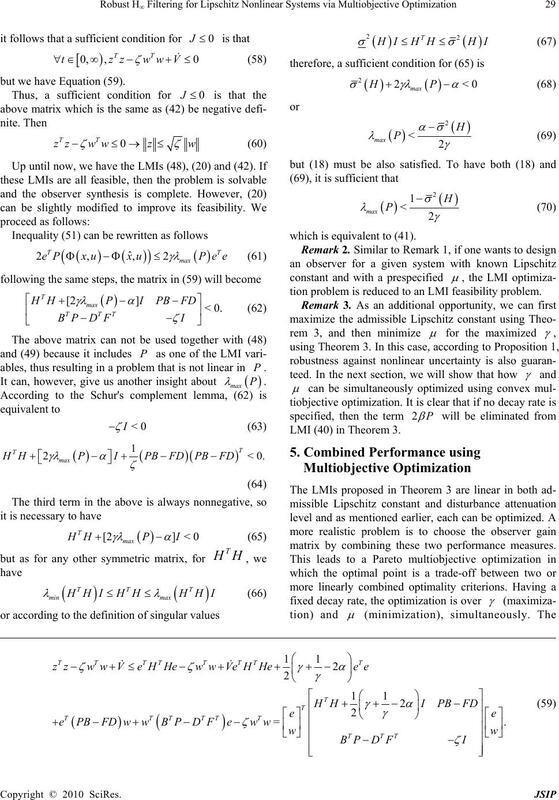 LMI (40) in Theorem 3.
matrix by combining these two performance measures. server is shown via three design examples. improved by a factor of 2.42 . Figure 1, shows the true and estimated values of states. Figure 1. 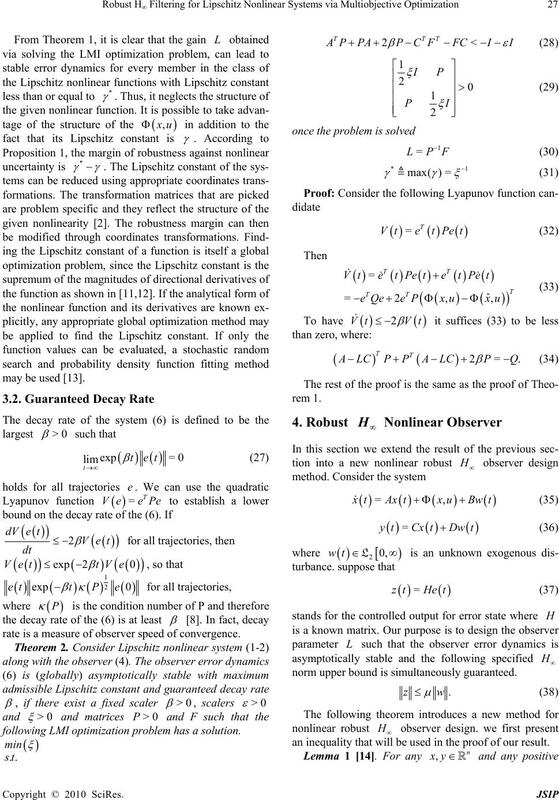 The true and estimated states of Example 2.
only guarantee stability of the observer error. Figure 2. The true and estimated states of Example 3 in the presence of disturbance. can be either a fixed scaler or an LMI variable. 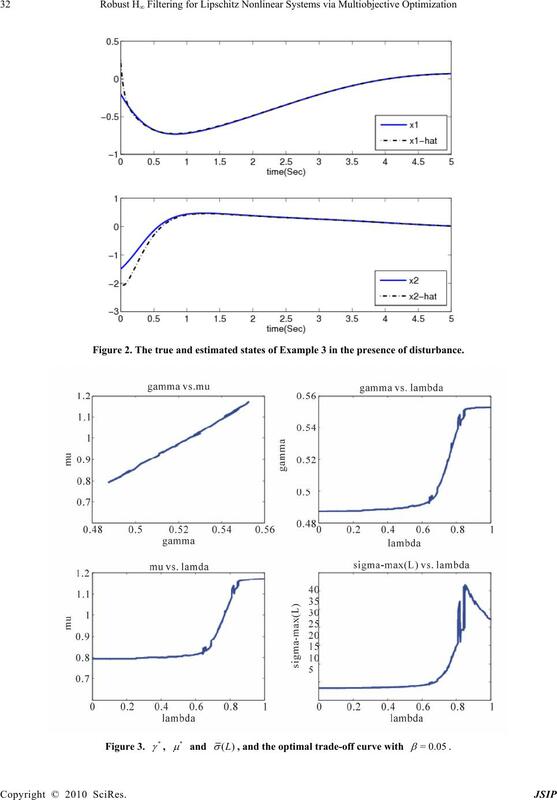 function of the proposed Pareto convex optimization. 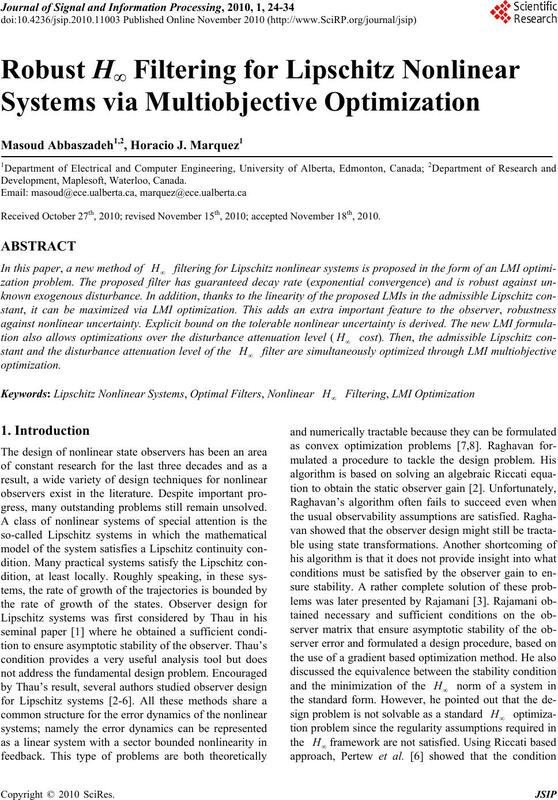 nonlinear systems proposed based on LMI optimization. obtained observer has three features, simultaneously. ance showed through design examples. 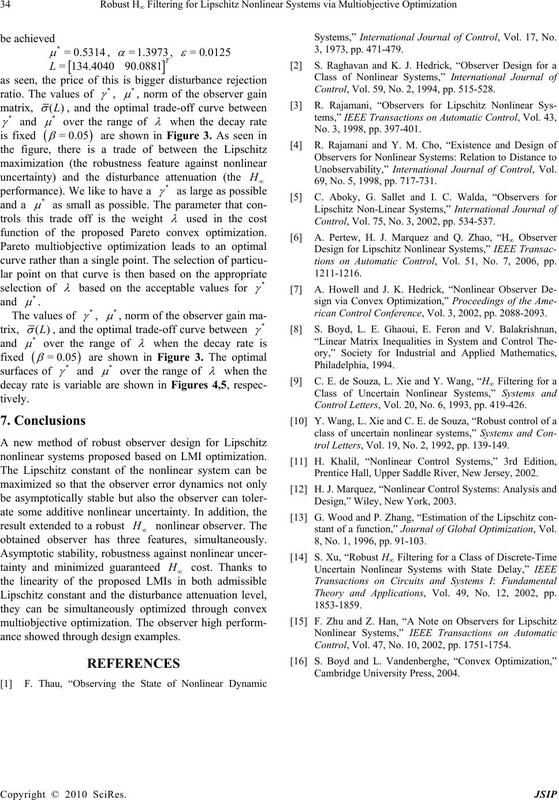 Systems,” International Journal of Control, Vol. 17, No. Control, Vol. 59, No. 2, 1994, pp. 515-528. No. 3, 1998, pp. 397-401. 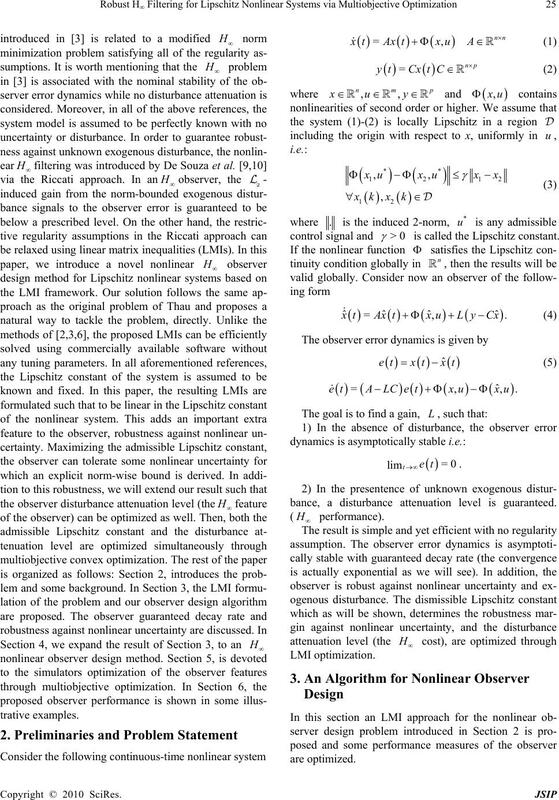 Unobservability,” International Journal of Control, Vol. 69, No. 5, 1998, pp. 717-731. Control, Vol. 75, No. 3, 2002, pp. 534-537.
tions on Automatic Control, Vol. 51, No. 7, 2006, pp. rican Control Conference, Vol. 3, 2002, pp. 2088-2093. Control Letters, Vol. 20, No. 6, 1993, pp. 419-426.
trol Letters, Vol. 19, No. 2, 1992, pp. 139-149. Prentice Hall, Upper Saddle River, New Jersey, 2002. 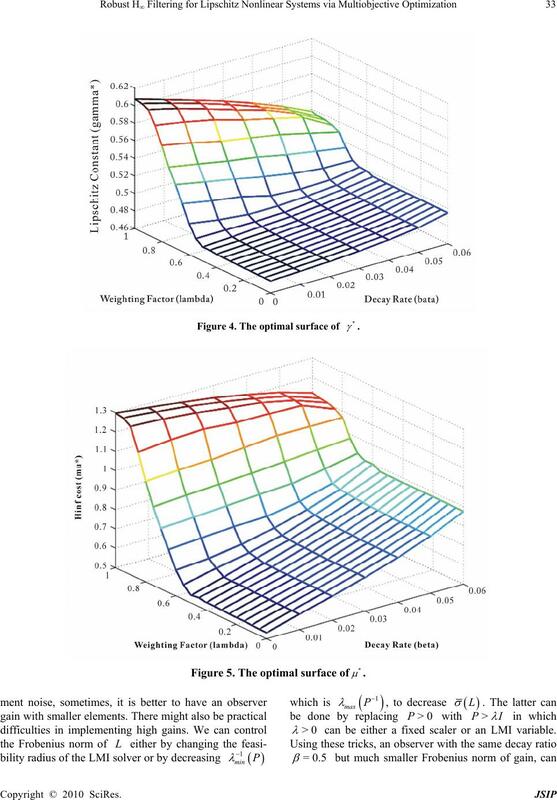 Design,” Wiley, New York, 2003.
stant of a function,” Journal of Global Optimization, Vol. 8, No. 1, 1996, pp. 91-103. Theory and Applications, Vol. 49, No. 12, 2002, pp. Control, Vol. 47, No. 10, 2002, pp. 1751-1754.